bl.uk > Online Gallery Home	> Online exhibitions	> Asia, Pacific and Africa Collections	> Thanty Pa'ra [Tantipara Masjid]. 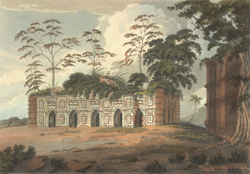 Coloured aquatint from a painting by Henry Creighton dated to 1817. Built by Shams' ud-din Yusuf Shah in around1480, the ruined Tantipara Mosque exhibits some of the finest embossed brick detail in Bengal. There are 5 entrance arches, 10 domes now fallen, and an engaged octagonal turret at each corner. The building is 87 feet long. The city of Gaur was the capital of the Bengal sultanate from the mid-fifteenth century following the move from the nearby city of Pandua.